While the cinematic landscape boasts a reasonable number of high-quality “initial sequels”, it becomes much tougher to find good “second sequels”. Maybe this should be called “Part 3 Syndrome”, as it seems awfully difficult to locate many that garner much praise. The template for 2010’s Toy Story 3 seemed daunting because the first two became so beloved, and I worried it’d be a Godfather situation. The first two movies in that series came out pretty close together and were regarded as classics, while the third hit screens much later and was viewed as a major disappointment. This scenario seemed more than possible for Toy Story. The first flick appeared in 1995 and was both a huge critical and financial success, while the second movie rolled out in 1999 and turned into an even bigger critical/commercial hit. And then Pixar waited 11 long years for Toy Story 3 - not as extended a nap as the 16 years between the second and third Godfather movies, but an awfully long break nonetheless. Could they recapture the magic a third time? According to critics and moviegoers, yes, as Toy Story 3 earned glowing reviews and bucketloads of money. With a US take of $415 million, Story 3 stands high on the list of highest-grossing animated films in the US. While the events of Story 2 took place not too long after the first movie, Story 3 jumps ahead a good decade or so. Andy (voiced by John Morris) prepares to go to college, so he needs to pack up his old stuff and thinks about giving away all his toys. Despite his status as a late teenager, Andy remains attached to his toys, so he decides to store them in the attic – and he plans to take his beloved Woody (Tom Hanks) with him. However, Andy’s mother (Laurie Metcalf) accidentally throws them away, and all the toys other than Woody nearly meet their demise in a trash truck. Buzz Lightyear (Tim Allen) and the others believe they’ve been abandoned, so they donate themselves to a local daycare. There they attempt to live with all the other toys, a group led by stuffed bear Lotso (Ned Beatty). Woody – who tracked his pals after they were tossed to the curb – tries to convince them of the mistake and get them to return home to Andy. Much intrigue ensues. The big question: is TS3 as good – or better – than either or both of the first two movies? The big answer: probably not, but maybe. The big answer partially depends on the film to which you compare it – and the respondent’s viewpoint. I dearly love both of the first two movies, but I must admit I’m a bit worn out on the original one. It’s a blast, but I’ve simply seen it so much over the last 20-plus years that it lacks its old punch. If forced to “objectively” pick the superior film of the first two, I’d probably opt for Story 2, but I still can’t say for sure because that sequel lacks the same fatigue factor. Sure, I’ve seen it many times since 1999, but I’ve probably not watched it half as much as I have the first Toy Story. While the two movies came out only four years apart, my video-watching habits changed enormously since 1999 – all because of this site. Before 1999, I rewatched movies a lot more because I didn’t need to constantly compose reviews like the one you’re reading now. Since 1999, I’ve not had nearly as much time to check out flicks again and again, so even over a mere four years, I saw a lot of Toy Story. Freshness/familiarity makes it even more difficult to assess how Story 3 fits into the series. I encountered the same problem with the last Indiana Jones movie: we lived with its predecessors for years, so we need a lot of time to assess the newest entry’s place. So how do I feel about Story 3? Come back in 10 years and ask me then. Ha ha ha! While I indeed reserve the right to change my mind, after three screenings, I think it’s at least in the ballpark of the first pair. Right now it’s still third, but that’s not set in stone. I suspect Story 2 will remain my favorite, but I could see Story 3 above the first movie, and who knows? Maybe I’ll eventually feel it’s the best of the bunch. Whether or not Story 3 achieves that goal, it’s somewhat amazing that there’s any potential debate. With other notable third entries in movie series, I’ve almost never felt they really competed with those franchise’s best efforts. Sure, I very much liked Return of the Jedi and Indiana Jones and the Last Crusade - and even Alien3 - but did I seriously view them as the best? No. And maybe I’ll never really think of Story 3 that way either, but at least it’s in the mix. My only real complaint about the movie relates to its story. On its own, the plot works just fine, and I think it comes out well as the film progresses. However, it feels a bit redundant, as the basic notion of toys who try to convince other toys to come home more than slightly echoes the core of Story 2. Both execute the tale in different ways, but I can’t deny the similarities. That remains essentially my only substantial knock on Story 3, though, as the rest of it works awfully well. Despite those slightly redundant themes, much of the flick feels pretty fresh. The integration of the new settings provides a good infusion of new blood, so the film doesn’t bog down in repetition. Of course, it helps with so much vocal talent along the way, and most of the original cast returns. Sadly, Jim Varney’s death required the recasting of Slinky, but Blake Clark carries the load admirably. Ned Beatty brings the appropriate depth to Lotso – the movie’s most complicated new character – and Michael Keaton’s Ken is an absolute delight. Indeed, Ken feels like the movie’s breakout character. Though not as prominent a part as Lotso, Ken plays an important role, and Keaton’s wonderful. He keeps things largely comedic, but he adds a bit of depth as well and turns in arguably the film’s most enjoyable performance. Story-wise, Story 3 ends up as the darkest of the bunch. To some degree, Lotso fills the same role as Story 2’s Stinky Pete, but the bear is a substantially nastier character. While Pete just wanted what was best for himself, Lotso feels the desire to actively inflict pain on others. If he’s gonna hurt, so is everyone else. Lotso’s actions lead to possibly the most emotional moment in any of the Toy Story movies. I don’t want to spoil the scene for those who’ve not seen Story 3, but it includes a moment of apparent tragedy that pushes the emotional envelope. Like all Pixar flicks, the film presents it in an understated manner that makes it all the more effective. It’s the kind of sequence that should be shown to all those morons who claim animated films are just for kids, as it’s tough to think of many live-action affairs that prove as powerful. Not that Story 3 stays there long, as it does usually focus on comedy – though comedy with a twinge of sentiment. The movie comes with a more wistful tone than its predecessors, mainly because of the sense of finality that comes with it. In the prior flicks, the toys endured various threats, but none that came directly from Andy. Sure, Toy Story’s Woody worried about his place in the toy hierarchy, but it wasn’t like Andy planned to dump the whole lot, and no similar threat occurred in the second film. We get hints of the Story 3 theme in Story 2, particularly when Jessie challenges Woody’s devotion to Andy. Story 3 pays off that concept in a satisfying manner. Is it entirely realistic? Maybe not, as it seems a little unlikely that a 17-year-old would remain so attached to toys, but I don’t think the idea feels totally off the rails. Heck, I suspect that when I was 17, I would’ve still maintained a sentimental attachment to some childhood faves, and there’s no question I was as normal a teen as you’d find, right? 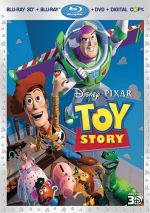 Toy Story 3 lacks the basic creativity of the first movie, and it’s not as dynamic/exciting as the second. However, it adds a greater level of emotional depth and thematic intrigue that allows it to rival its predecessor. It’s another winner that deserves to be seen as a strong achievement on a par with the earlier flicks. Toy Story 3 appears in an aspect ratio of approximately 1.78:1 on this Blu-Ray Disc. I’ve yet to see a less than stellar transfer of a Pixar flick, and Story 3 did nothing to disappoint. At all times, sharpness looked immaculate. The movie always boasted excellent clarity and definition, with even the smallest objects rendered tight and clear. No issues with jaggies or shimmering occurred, and edge haloes/artifacts were absent. Of course, no source flaws cropped up either, as the movie stayed clean and fresh. With all the toys on display, we found a nice array of colors, all of which excelled. The wide palette offered fine vivacity, as we got a broad, lively set of hues. Blacks came across as dark and deep, while low-light shots seemed smooth and clear. Nothing less than greatness ever graced the screen in this top-notch presentation. While not quite as impressive, the DTS-HD MA 7.1 soundtrack of Story 3 still worked well. The soundfield lacked a lot of opportunities to really dazzle, but it presented an unusually smooth soundscape. The mix featured a lot of gentle ambience, and those elements blended together well. They also provided excellent localization and movement. The surrounds usually focused on those atmospheric elements, but a few scenes added life. A thunderstorm filled the room well, and the action climax demonstrated quite a few impressive moments. This was generally less active mix than its predecessors, but it still did what it needed to do. Audio quality was always positive. Speech was natural and distinctive, without edginess or concerns. Music seemed lively and full, while effects were clear and concise. Low-end demonstrated good punch when necessary. Again, the soundtrack didn’t provide a consistently engulfing affair, but it was a solid mix anyway. This set includes both 2D and 3D versions of Story 3. The picture comments above reflected the 2D edition – how did the 3D compare? In terms of visual quality, both seemed pretty similar. Like most 3D images, brightness took a small hit, but shadows usually worked fine. In the end, this remained a quality presentation. As was the case with Toy Story 2, the 3D imaging of Story 3 bounded out of the gates in an exciting manner. The opening action sequence used the stereo capabilities in a fun way and gave us an active visual punch. After that, though, the 3D tended to be more subdued, as the movie generally opted for depth and environmental immersiveness. These moments still added to the experience, though, and helped make this a good – though not great – 3D image. Most of the package’s extras show up on a platter dedicated to supplements., but we get a few on the “movie disc”, as we find a short called Night and Day. The piece ran with theatrical screenings of Story 3 and focuses on two blobby dudes in whose bodies we can see the world. One’s stuck in the day and the other’s set at night; they try to come together. We see some clever bits in Night, but it’s too heavy-handed for my liking. It throws out a pretty obvious message about unity/accepting differences. That’s not bad thing, of course, but I think the short does so in a hammy manner. It’s got some entertainment value but isn’t a favorite. Buzz Lightyear Mission Logs: The Adventure of Science offers a four-minute, 25-second educational piece. Pixar worked with NASA to offer some info about space missions and research. It mostly focuses on that footage, but we also find unique animated elements that use the voices of Tim Allen, John Ratzenberger, Don Rickles and Wallace Shawn. It’s a fun piece. 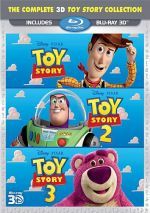 Finally, this disc includes Toys!, a six-minute, 37-second look at the character work in Story 3. We hear comments from production designer Bob Pauley, characters supervisor Sanjay Bakshi, supervising animators Bobby Podesta and Guido Quaroni, character modeling and articulation artist Austin Lee, animator Carlos Baera, director Lee Unkrich, producer Darla K. Anderson, and character art director Daniel Arriaga. They talk about a mix of animation issues in this short but informative program. A few ads open this disc. We get clips for Tangled, The Search for Santa Paws, Bambi, and Cars 2. Under Sneak Peeks, we get promos for Maters Tall Tales and The Incredibles. With that we head to the extras disc, where we open with Film Fans, and the main attraction here comes from Cine-Explore. Also found on Pixar discs like Cars and Up, this provides an alternate form of audio commentary. We hear from director Lee Unkrich and producer Darla K. Anderson. Both sit together for this running, screen-specific look at the opening sequence, story and character topics, set design and visual issues, animation and technical subjects, music, editing, cast and performances, and some other movie-making bits. Expect a dynamic chat here. Though both participants provide good info, Unkrich carries the show and delivers most of the material. He really makes this a terrific conversation, as he ensures we learn a ton about the movie. The track moves well and keeps us entertained and informed. The “Cine-Explore” format adds art and photos as the film progresses. These reflect the content of the commentaries. We see storyboards, concept art for characters and other early designs as well as pictures of cast and crew. “Cine-Explore” option adds a little kick to the standard commentary. It certainly isn’t revolutionary, but it gives you a bit more content as you watch. This is a nice touch. I tape commentaries and listen to them elsewhere, partially because it’s more efficient, but also because it’s so dull to stare at the screen as you check out a commentary. Cine-Explore provides added material that brings a bit more flair and involvement to the usual film discussion. Additionally, the disc provides an Alternate Commentary. This features notes from production designer Bob Pauley, supervising animators Bobby Podesta, Mike Venturini and Guido Quaroni, and story supervisor Jason Katz. All of them sit together for a running, screen-specific piece. As you might expect, the commentary mostly sticks with technical topics, as it goes over visual design, animation and art, and the like. It also gets a bit into story and maintaining continuity within the Toy Story universe. If you only want to screen one commentary, I’d recommend the Unkrich/Anderson piece, but that doesn’t mean this one doesn’t have value. While the subject matter can be a bit dry – and some of the same info from the first track reappears here - the participants still manage to deliver a nice examination of the film. We get a good feel for the technical areas and learn a reasonable amount. Nine featurettes also appear under “Film Fans”. Roundin’ Up a Western Opening goes for five minutes, 42 seconds and provides remarks from Anderson, Unkrich, Katz, and editor Ken Schretzmann. It looks at the evolution of the film’s opening sequence, and it gives us a good overview of the related subjects. It’s especially fun to see the storyboards for an abandoned version of the opening. With the six-minute, 26-second Bonnie’s Playtime: A Story Roundtable, we hear from Unkrich, Katz, and story artists Adrian Molina, Matt Luhn and Erik Benson. All five sit together to chat about the scene in which Woody meets Bonnie’s toys. I like the “roundtable” format, and the participants use the time well to explain what they wanted to do with the sequence. Again, we learn about unused thoughts as well as the rationale behind the final product. It becomes another strong exploration of the processes. Next comes Beginnings: Setting a Story in Motion. It goes for eight minutes, 13 seconds and provides remarks from screenwriter Michael Arndt. His comments accompany animation used to illustrate his thoughts. Arndt talks about how to introduce main characters and stories; he refers to the original Toy Story as well as Finding Nemo and The Incredibles to explain storytelling basics. Not much of this directly connects to Story 3, but that’s fine, as Arndt’s discussion proves to be compelling. Life of a Shot lasts six minutes, 57 seconds and includes notes from Anderson, Unkrich, Katz, Schretzmann, art director Daisuke “Dice” Tsutsumi, director of photography – lighting Kim White, sets art director Robert Kondo, matte painter Denise Blakely Fuller, animators Carlo Vogele, Becki Tower and Matthew Strangio, simulation and effects artists Rogan Griffin, Nick Lucas, Michael Fong, Bill Watral, Mach Tony Kobayashi, Chris Chapman and Konstantin Promokhov, shot lighting artists Esdras Varagnolo and Sungyeon Joh, layout artist Mahyar Abousaeedi, story artists James Reinhart Robertson and Jeff Pidgeon, assistant to the director Duncan Ramsay, Luxo Cade manager Luigi Passalacqua, simulation and effects lead Ferdi Scheepers, directing animator Robert H. Russ, art manager Lourdes Marquez Alba, production artist Paul Topolos, music editor Barney Jones, and post production supervisor Paul Cichocki. It takes all those people to tell us how it takes all those people – and more – to create a single Story 3 scene. The show offers a good way to demonstrate the scope of such projects, and it lets us know about some of the “unsung heroes” who help create feature animation. For a look at the short film, we head to Making of Day and Night. It goes for a mere two minutes and features director Teddy Newton and producer Kevin Reher. They simply tell us a little about the short and show some clips. It’s essentially just an advertisement. Info about staff members pops up during Paths to Pixar – Editorial. The four-minute, 38-second piece features Schretzmann, Unkrich, film editors Robert Graham Jones, Anna Wolitzky, Torbin Bullock and Steve Bloom, assistant editors Renee Steen and Jeanne Applegate, and second assistant editor Bradley Furnish. They tell us a little about their work and how they ended up as editors. This isn’t the disc’s most fascinating piece, but it fleshes out the various roles in a decent manner. Three Studio Stories finish “Film Fans”, and these include “Where’s Gordon?” (2:16), “Cereal Bar” (1:36), and “Clean Start” (3:05). They offer tales from Anderson, Podesta, Tia Kratter, Adam Burke, Andrew Stanton, Pete Docter, David Park, Nicole Grindle, and Andrew Gordon. Each clip combines crude animation with anecdotes about their lives at Pixar. These are all entertaining and enjoyable to hear. With that, we move to Family Play and its five featurettes. The Gang’s All Here goes for 10 minutes, 46 seconds and delivers statements from Anderson, Unkrich, and actors Tom Hanks, John Ratzenberger, Ned Beatty, Tim Allen, Estelle Harris, Jodi Benson, Kristen Schaal, Blake Clark, John Morris and Bonnie Hunt. We learn about the return of the original actors along with casting new ones. The show’s pretty glossy, but it’s fun, and I especially like the alternate lines that pop up along the way. Next we get the eight-minute, two-second Goodbye Andy. It throws in notes from Unkrich, Pauley, Bakshi, Quaroni, Morris, Podesta, Anderson and animators Daniel Nguyen and Michal Makarewicz. They discuss the animation of human characters, with an emphasis on Andy and the movie’s final scene. We get a solid exploration of the choices and challenges here. Accidental Toymakers lasts three minutes, 56 seconds and boasts material from Unkrich, Pixar CEO John Lasseter, and Thinkway Toys president/CEO Albert Chan. They talk about the production of toys based on movie characters, with an emphasis on the shortsighted choices made by retailers in 1995. Boy, the folks at Pixar gotta let that one go – they’ve been whining about it for years! It’s interesting to learn a little more about how the characters went from movie to actual toy, but the piece is too brief to be truly informative. During the five-minute, 19-second A Toy’s Eye View: Creating a Whole New Land, we hear from Lasseter, Walt Disney Imagineering Paris show producer Chrissie Allen, and Imagineering Hong Kong senior show producer Jodi McLaughlin. They tell us about various Toy Story-themed attractions at different Disney parks. It’s essentially an attempt to promote the parks, but it’s still fun. Finally, Epilogue goes for four minutes, 23 seconds and simply shows the animated sequence that accompanies the end credits. Why include it here? Because we get a better view of it without the text; presented 1.33:1, it’s substantially larger than it would be during the movie. Under Games and Activities, we get one component: the Toy Story Trivia Dash game. This pits two players against each other as they answer timed questions about the various Toy Story movies. The items can be moderately tough, and this ends up as a surprisingly fun game. A mix of materials show up under Publicity. Grab Bag lasts four minutes and shows a compilation of little Toy Story character bits and gags. It’s unclear where these ran, though many promote the 3D screenings of Story 3, so I guess they ran in front of other 3D flicks. Whatever the case may be, they’re amusing. Another humorous piece arrives via Ken’s Dating Tips. It runs one minute, 36 seconds and offers just what the title describes: Ken’s goofy advice. Michael Keaton’s performance as Ken is a highlight of the movie, so these continue the amusing trend. Next we find two Lots-o’-Huggin’ Bear Commercials. Pixar created these to look like ads that would’ve run in the 1980s to promote a real Lotso. One is in English, while the other’s in Japanese. Both are very convincing fake artifacts. We hear more about those “ads” in Making the Lots-o’-Huggin’ Bear Commercials. It goes for one minute, 27 seconds and simply shows footage from the shoots. The absence of any comments makes the piece less valuable, as we don’t really learn much from it. Three more promo bits follow. We find Internet Chat (1:00), Security Cam (1:12) and Gadgets (0:58). Each one uses a clever way to let us know of the film’s then-impending release. I like “Cam” best, as it presents the characters ala a Paranormal Activity style horror flick. Dancing with the Stars at Pixar goes for two minutes, 23 seconds. It brings the reality show’s choreographers to Pixar to help create the Buzz/Jessie dance at the film’s end. It proves to be reasonably informative. After this we locate a long list of trailers. We get “Silence” (0:40), “Anti-Piracy” (1:04), “Teaser” (1:44), “Trailer 2” (2:21), “Trailer 3” (2:30), “Japan Teaser 1” (1:02), and “Japan Teaser 2” (2:44). Character Intros fill two minutes. These give us quick glimpses of Ken, Lotso, Trixie and Mr. Pricklepants. They add some clever tidbits with the new characters in TS3. Finally, we get a Poster Gallery. It delivers a collection of thumbnails that can be enlarged to see the full art; we find 25 images in all. These look great and are fun to see. Finally, the set provides a DVD Copy of Story 3. Note that this is the standard DVD you’d buy on the shelves, not some emasculated barebones one, so it includes a good selection of extras. Does Toy Story 3 equal the delights found in its two predecessors? Pretty much – I still prefer the first two flicks, but I think Story 3 offers a terrific experience that doesn’t disappoint. The Blu-ray comes with excellent picture, very good audio, and a strong selection of supplements. This terrific package definitely earns my recommendation, and the 3D version becomes a fun way to watch it. 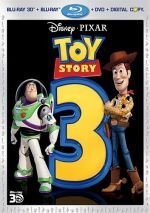 Note that the 3D Toy Story 3 can be purchased on its own in the version described here or as part of a three-movie package. 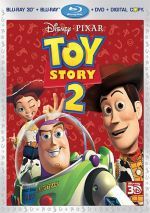 That one also includes 3D renditions of Toy Story and Toy Story 2 - but it omits all of those movie’s bonus materials. If you already own the films on 2D Blu-ray, the “movie-only” version offers the best deal, as it sells for much less money than the three “comprehensive” packages added together.